InspireHUB's latest white paper helps executive leaders improve their organization's productivity and internal communications, including insights on app trends and industry predictions from tech leaders on the current mobile market as the world of “native app” and “progressive web app” technologies merge. How has the need for the mobile app landscape shifted? What is the research showing about this new technology? How are major brands responding to this shift? How can I get ahead of the curve on using this technology? 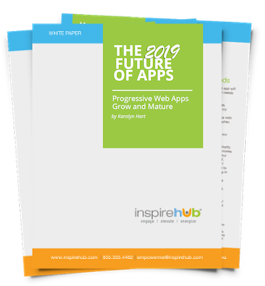 This white paper will help you understand the different types of apps - why there is such a buzz around Progressive Web Apps - and how other businesses and organizations are using PWAs to better engage both their employees and their users! The app landscape has radically shifted. Progressive Web App (PWA) technology has been in development since 2014 but breakthroughs in mobile features (once only available exclusively on native apps) combined with its ability to be used successfully on any device has resulted in major brands and retailers making the switch. Twitter, Instagram and Pinterest were joined in 2018 by Uber and an ever-widening adoption of PWA within the consumer technology industry. Moving from "mobile-first" to "digital first," working on ALL devices. Marketers and businesses have been told since 2014 that being ‘mobile first’ is a dated strategy. The arrival of PWA made that approach extinct and ushered in the new era of ‘digital first’ and forces every technology and platform to be device-agnostic. If you are in the business of digital engagement, understanding what is happening with PWA will be the difference between your future success or failure. As YouTube's Chief Product Officer, Neal Mohan (then SVP at Google) shared back in 2014 at the RampUp online ad conference, "90% of consumers start a task on one device and finish it on another." Five years later the “mobile app” as we knew it is also dead. The next evolution of apps will look entirely different for the next generation of users. Unhindered from the walled gardens of play stores with access to powerful engines once reserved for enterprise systems, they will go faster and reach farther than their predecessors. Major retailers and businesses are making the switch. The white paper provides case studies and useful resources to show how how far Progressive Web App technology will reach as the largest brands in the world are making the switch. With Google, Microsoft and Samsung leading the way and Apple now following suit, PWA is becoming ubiquitous and the future is here. The full white paper also has analysis and trends from industry thought-leaders. Download today to get the full story!